Whew, what a week! This week has been one of my busiest weeks trying to get all of my past three projects worth of research summarized in an hour long PowerPoint presentation for management. If you all remember my ten week plan I am now into my sixth week here, and just ending my sixth week actually. So far I have learned how to update our facebook and twitter pages, I have blogged on Intel’s behalf. Conducted and analyzed the results of a survey on movie watching preferences, started doing some market research on the video market in China, this next week I will be doing more research on China, starting to get into the India movie market, and then do some research on Brazil and Russia, also I am going to conduct some focus groups. But before I get too carried away by the work I still have to do let me get into the nitty gritty of my past work and what my schedule has been looking like lately. Yesterday, I put the final touches on my presentation about my survey. I had side by side pie charts, and key takeaways for the survey. Additionally I included a bit about my other research, and got to give my personal opinion on topics like PC usage, Piracy and what it was like working at Intel. The meeting itself was an audio-bridge meeting meaning, that myself, my manager, and the top manager were all in one room as I presented, and the rest of my team located in Oregon dialed in to hear what I was talking about. The whole presentation, including discussion and questions from my team took exactly an hour. It was nice seeing that people actually found my research helpful, and I learned that I have some learning to do in the ways of titling my slides, and citing my graphs. I find that I am constantly learning more and more about presenting. A few people even emailed me asking to set up some one-on-ones about my research. Today, I am having lunch with my manager and a person on my team who is visiting from Germany, his son helped us out by sending my survey to some of his friends, so I had some international input in my sample! Besides my presentation, I am also getting more of an international exposure in terms of the fact that I am daily making calls after my working hours to people in China and India. At first I was nervous about these calls, and not really sure how to conduct myself and if I was even asking the right questions. What I’m finding however is that once I start talking to people, they offer me their own take on things, and before I know it I am learning what the main issues are and how to apply them to my research. Last entry I also talked about making connections. Well recently I attended an intern event in which I got a chance to be surrounded with other interns and some of the directors at Intel. I even met with a person here that got his MBA, he offered me his input an insight on getting into grad school, and what he got out of it. Today, I am looking forward to my lunch with a teammate. And next week I am offering some input on a co-workers work, and getting some help with my presentation skills. I am also hoping to collaborate with a teammate on our common research and see if we can learn from each other. For me, pushing myself to take the opportunities I see and meet people, has really opened up my eyes and is making this internship a lot less lonely. And while I do think that the work I do is something I should find enjoyable, as a somewhat sentimental person, I figure making friends along the way might be just what I need to keep enjoying work life. Here is a picture of some intern goodies I got from my intern event! For the next few weeks I will be trying to get some focus groups going and also taking some time off work to move into my new apartment and attend my uncles wedding! 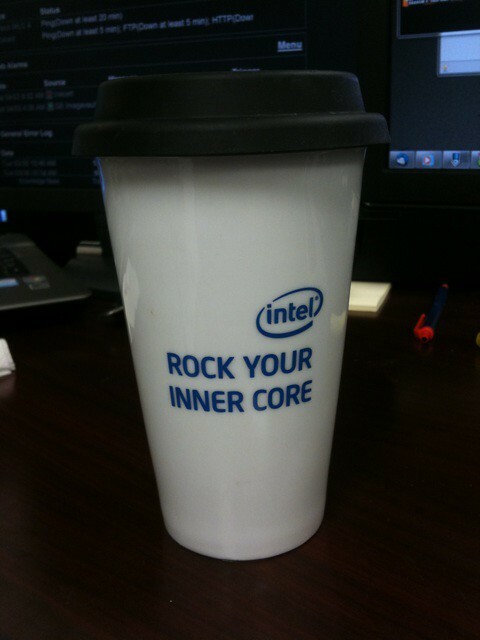 Here is a picture of some of the Intern Goodies I got while attending a presentation by some of the managers at Intel. Mine does not have this cool saying on it, it says something about being an Intern in 2012 but I liked this cup anyway!